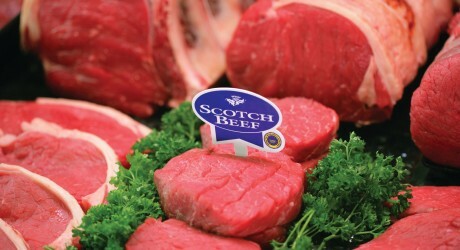 The YouGov Plc online survey of 1,094 adults in Scotland, undertaken from 15th – 18th February, revealed 14 per cent of Scots who are aware of the Scotch beef logo now trust the Scotch Beef brand more they did prior to the horsemeat issue hitting the press in mid-January. The responses revealed 47 per cent viewed buying local beef more important to them with 37 per cent stating it was neither more nor less important. Of the remainder, 11 per cent stated they ‘never buy local beef’, with three per cent saying they ‘don’t know’ and just two per cent saying it was ‘less important’ to them. Jim McLaren, chair of Quality Meat Scotland, welcomed the results. He said: “The good news is these results give a clear indication that consumers in Scotland continue to have a high level of trust in the Scotch Beef brand. Note to editors: All figures are from YouGov Plc. Total sample size was 1,094 adults in Scotland. Fieldwork was undertaken between 15th – 18th February 2013. The survey was carried out online. The figures have been weighted and are representative of all Scottish adults (aged 18+).